Read along or listen to the 2nd place winning story of the 2011 short story writing contest. "I am bored," announced the queen. Her advisor pressed his fingers together. "Some music, your majesty?" The queen gave a slight nod. But when the court musicians started playing something she had heard a dozen times before, she sent them away. Her advisor tugged at his moustache. "The court acrobats, then?" The queen nodded again. But their flips and turns did not raise her spirits. "What you need," said the advisor, "is a true diversion. A contest, perhaps." The queen sat a little taller. "A contest, you say?" Then she sank back into her throne. "Whatever of?" Her advisor furrowed his brow. "New music, perhaps?" The queen waved her hand. Her advisor started to sweat. "I know! A contest of the best portrait of Her Highness." The queen chortled. "Please. I already know what I look like. Besides, the hall is brimming with portraits." She rose and started pacing. "I am tired of all this," she said, gesturing to the room. "I need a different sort of beauty. Something that can take one's breath away." She gestured to her scribe. "Let everyone know that the Queen is holding a contest for the most beautiful thing in the world. And the prize," she paused, "the prize shall be this crown." Her staff gasped. 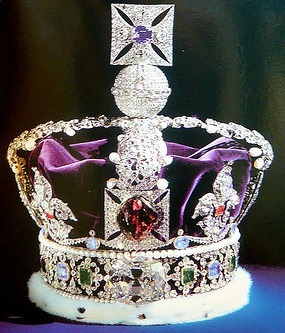 The queen's crown was pure gold, studded with magnificent gems. There was no treasure like it in the whole country. The announcement was made. Before long, a constant line of hopefuls formed. People showed their poetry, their daughters, even their animals. After several days, the queen had a pounding headache. "This is hopeless," she muttered. "Not quite hopeless, Your Majesty." The queen sat up, wondering who dare contradict her. A bearded man stood behind the palace guards. "I can put an end to this madness, Your Highness." He waved towards the long line of supplicants behind him. The queen raised an eyebrow. "You have brought me the most beautiful thing?" The man laughed. "Not I. Nor anyone here. I have stood in line for two days as your faithful servant to tell you that you seek that which cannot be brought to you. You must go to it." The man gave a deep bow. "That is all." The queen paused, astonished. When she found her voice again she asked "Whatever do you mean?" The queen's advisor twisted his hat. "Do not bother yourself with the prattle of a madman, Madam," he said. But the fever of an idea had struck the queen. "Send the rest home," she ordered of the people still waiting in line. "I must prepare for a trip." The advisor nearly dropped his hat. "A trip? Where?" The queen smiled as she had not done since she was a child. "Elsewhere!" A Royal Trip, even one as odd as this, doesn't just happen. Wardrobes and food wagons must be prepared. Soldiers, footmen, and ladies-in-waiting must ready themselves. But after several days of bustle, the royal procession was ready. By now, the Queen was cured of her boredom, and almost delirious to see what awaited. Crowds gathered as the entourage made its way out of the city. The Queen leaned out the carriage window and held her crown high. "To the most beautiful thing in the world!" she cried. "To the most beautiful," the crowds cheered back. The fever had caught, and spread. The queen was not sure what she was seeking, or where to find it. But as her entourage rounded a hill, she looked back to her royal home and felt something stir within her. Between the glow of the setting sun and the gleam of the white towers, the scene looked like something out of a storybook. "Why," she wondered, "have I never seen my home this way before?" The queen spent weeks travelling. She saw beauty in the peasants coaxing life out of the dirt. She saw it in the birds taking one last flight before roosting for the night. In a newly born calf. In the stars twinkling at night. But what was the most beautiful thing? One day, the queen sailed a lake. In the middle of the water, she realized that she was at peace - and that she had been for many days. Suddenly, she understood. With all her might, she tore a piece of her crown off. She tossed the fragment into the lake and watched it slowly sink. "I am ready to return home," she announced. As she journeyed back, the queen left a piece of crown at a small country church. She left a piece at the root of a centuries-old tree. She placed a piece at the bottom of a lush valley and the top of a snow-capped mountain. When her procession stumbled upon a spring, bubbling water from the ground, she added a piece there. She dug a piece into the newly turned dirt in a field. She threaded a piece into the mane a fine filly. Little by little, the queen's crown got smaller until nothing was left. She had found the most beautiful thing. It was the world. This book was great and a nice story to. Whoever wrote this is a genius. I'm sure my 8 year old will love this!!! That was great! I liked the most beautiful thing in the world. The story was nice. I enjoyed reading with my mother. It is the best story I ever heard. I thought it was wonderful story, very creative way to teach children. I loved it. Good luck with this. It was a pleasure for me to read it. I love the title, too. I loved how it was written and divulged. It has a message for all of us young and old. It is a beautiful story that teaches young people without moralizing what is truly important. I thought it was going to be different(more about maintaining personal beauty) and then I was pleasantly surprise by the change in the queen.